Milagu Sadam i wanted to post for a long time in the bachelors recipe series. Milagu sadam was a request by a bachelor reader too. Finally i made this yesterday. 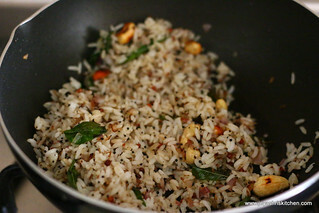 This is a very simple south indian rice variety. 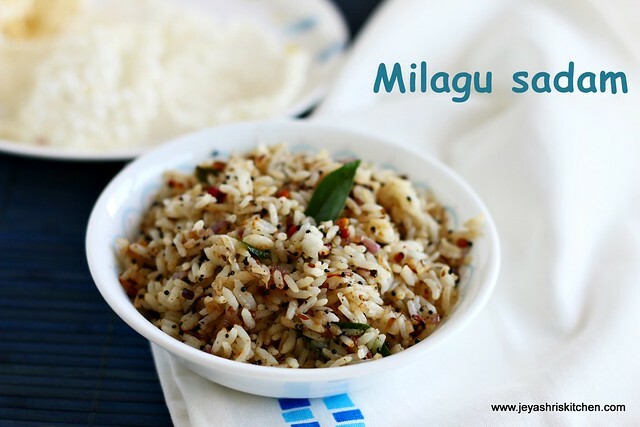 Being bored with parupu podi and pulikaichal, this milagau sadam will be a easy and quite flavourful one to have at home or pack it for lunch box too. No hard and fast rules in making easy bachelors recipe. Just be creative with your ideas. I have given few at the end of the post. 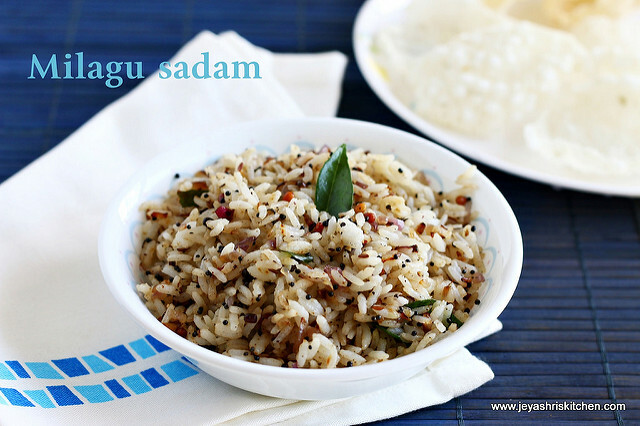 Tryout this easy Milagu sadam| Pepper flavoured rice. 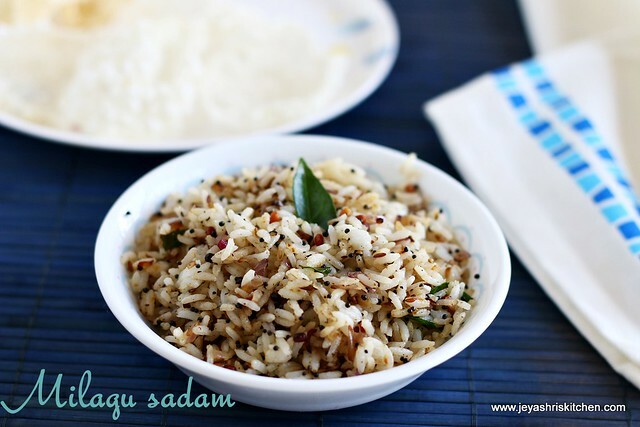 For bachelors of guys who are staying away from home try out this spicy pepper rice. Cook the rice with 3/4 cup of water and add few drops of ol while cooking. I used Par boiled rice ( puzhungal arisi). If using raw rice or basmati rice just add 1/2 cup of water only. 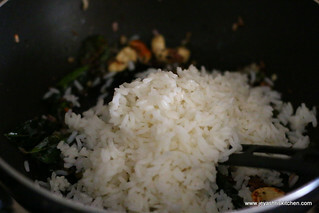 Allow the rice to cool in a wide plate. 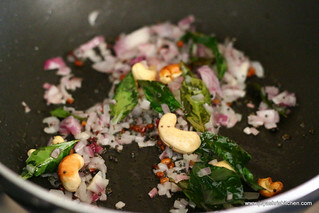 If adding onion, finely chop them. 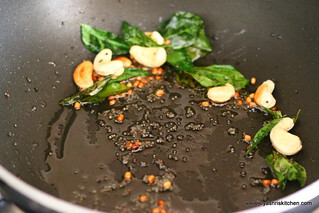 In a pan add oil and throw in the mustard seeds, urad dal, cashew nuts and curry leaves. 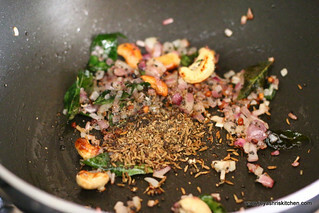 Add onions to this and cook till the it becomes pink. 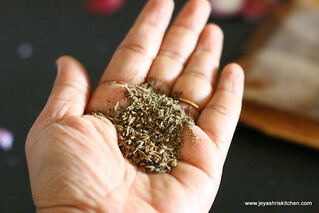 Pound the pepper and jeera coarsely in a mortal and pestel. Add this to the pan. Add Salt. Add rice to this and keep the flame low. Gently mix this well. and switch off the flame. If needed add few drops of ghee to enhance the flavour. Milagu sadam is ready. Serve with any papad or vadam. We had with javarisi vadam. You can add grated carrot in the last to make it colorful and healthy. Adding peanuts instead of cashew nuts will be nice too. Even boiled green peas can also be added to make it colorful and healthy.